Fishing overnighters is a unique experience and can be one of the most productive ways of fishing. Throughout the hours of darkness, carp will give away important snippets of information which you can use to gain the upper hand. They can commonly be heard crashing or showing during the twilight hours, so getting on the bank to capitalise on these signs is a must! Use this information to position your rods in appropriate areas, according to where you have seen or heard the carp and get ready for any feeding spells that your lake may have. The most common feeding spell or ‘bite time’ is around first light. The hour or so before first light and the couple of hours after first light are often very productive on most venues. 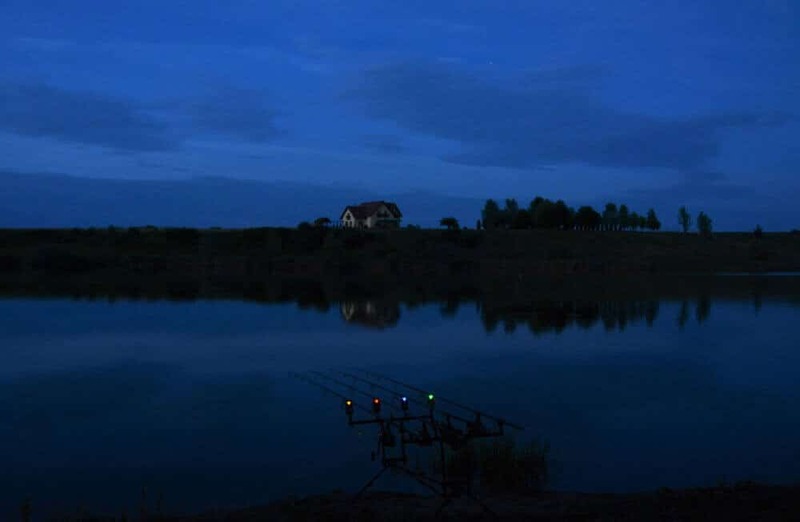 By fishing an overnighter, not only do you give yourself a chance to catch a carp during the night, but your rods are also in position ahead of this first light period. This gives you a huge advantage over those anglers who turn up in the morning to begin fishing, disturbing their chosen swims in the process. Apart from the benefits of being able to gain information, overnighters will obviously also give you more time on the bank. Basic probability dictates that the longer your rods are in the water, the greater chance of a bite. We go fishing because we enjoy it and an overnighter will give you a different type of experience than you simply cannot get from fishing in the daylight hours. It really allows you to take in the atmosphere of a lake, its surroundings and wildlife in a different way. I always feel a different appreciation of nature as I settle down in my swim and watch the darkness start to roll in. Your senses become heightened during the hours of darkness and this can make playing a fish especially exciting. Put simply, you really have to get out and do it, I promise you won’t regret it! Having a bivvy or a brolly is a must for doing an overnighter, the last thing you want is to be caught out by any unexpected weather, especially during the night! There are plenty of variations of bivvies and brollys on the market, but you definitely want to go for one that is quick and easy to set up. Ask yourself ‘if I were to turn up in the rain with this, would I be able to quickly set it up so that the rest of my kit remains dry?’ If the answer is no, you could be in for an uncomfortable trip further down the line. Conversely, in good weather, having a set up that you can quickly deploy will enable you to get your rods sorted and out on the spots you want to fish that little bit quicker. In turn, you get more time with your rods in the water; giving you more chance of that all-important bite. A bed chair and good sleeping bag are essential for doing overnighters of any description. You may also find other variations such as sleep systems – these pieces of equipment combine a sleeping bag with a bed chair and so are great too. Whichever option you choose or may have, they are so important if you want to get any kind of reasonable sleep. A bed chair gets you off the cold damp ground. Couple this with a good sleeping bag and it really makes for a warm, comfortable night’s sleep. Being comfortable during your overnighter is important. It means you can concentrate on your fishing and can focus your efforts into catching that all-important carp or two, instead of worrying about being cold or uncomfortable. If you suffer from a bad back, which is very common these days, there are bed chairs with added lumbar support and these can really enhance your comfort. In addition, a pillow is something that is often forgotten but again really is an important item to remember. Keeping your strength up during an overnighter is key. Make sure that you have adequate cooking equipment along with food, water or any other drinks you fancy. As you will be on the bank throughout the evening period, being able to cook an evening meal and make hot drinks will make for a much better stay. A stove, kettle and a pan set will generally be all that you need to cook a decent meal on the bank, although if you are after something a bit more extravagant, you may need some other equipment. However, keep in mind that you are on the bank for a relatively short period and the less equipment you have to move around the lake the better. Whatever you do though, definitely do not compromise on the essentials! Storing your food in a way to keep it fresh whilst you are on the bank is something to take seriously, especially in the warmer months. There are plenty of cool bags on the market. These along with an ice block will keep your food fresh, which could save you from becoming ill and ruining your fishing, something that is more common than you may think. If you’re going to do an overnighter, it’s a given that it will get dark at some stage. Depending on the time of the year, this could mean having to endure darkness for long periods. Having a head torch with you is essential as it allows you to see during these hours of darkness. Playing a fish in the dark is a challenge, so having the aid of a head torch is key and will make landing a fish much easier. Another type of light to consider (more so for the winter months) is the bivvy light. A bivvy light can make those long periods of darkness a little easier to contend with. As the name suggests, these light your bivvy up and make simple tasks like tying rigs and cooking much easier than they would be with just a head torch. When fishing an overnighter you simply must have bite alarms for your rods. Without these, it is almost impossible to know when you are receiving a take during the night. Not only is this bad for your fishing, as you would be unaware of the bite, but it puts the fish at risk and seriously jeopardises their safety – which is unacceptable. You must not fish during the night without bite alarms. Having reels that allow fish to take line are also important. Your reels should have a free running function, whether this is through loosening the clutch or by having a bait runner function. This is vital, as it will prevent your rod from being pulled in and you losing your rod and reel. It also reduces the chance of the fish becoming tethered or snagged up in the lake. Spare clothes are often overlooked. Checking the weather before you go is good practice as you can pack for the conditions that you are likely to encounter. With that said, unforeseen circumstances can arise. I for one have been caught in a sudden downpour whilst playing a fish, and it really soaks you through. Playing the fish is the good bit, but getting into your bed in wet clothes is a real buzz kill. By simply packing some spare clothes, you can remain comfortable, warm and motivated to make the most of your fishing. Overnighters give you a completely different perspective that you just cannot glean from fishing in daylight hours. The buzz you get from catching a fish during the night is fantastic and can only be experienced. Do not substitute essential items or your own comfort, but try to keep your kit to a minimum in order to stay mobile before setting up in your chosen swim. Don’t forget to look for those snippets of information that can be given away during the hours of darkness and capitalise on them to make the most of your overnighters! Introduced to carp fishing in my early teens, as soon as I landed one I was simply hooked. These days I get out as much as possible, enjoying day and overnight sessions. I generally fish a host of day ticket waters in the south in addition to club lakes. This provides me with the opportunity to fish many different types of waters, which I love. What Does It Mean to Be Good at Carp Fishing?